At the moment, Facebook is engulfed in some problems after it was found out that a particular data firm called Cambridge Analytica reaped the private details and information of an estimated number of about 50 million users and this was done without the consent or permission of the users. With this knowledge, you probably would be thinking if there was something you could do about applications such as this one getting a hold of your information. Among the list of most of the perturbing factors associated with the privacy problem of Facebook is the fact that the data wasn't gotten by Cambridge Analytica by means of hacking into Facebook or breaking the security system, but rather, it was gotten by means of a genuine Facebook application which gathered the information of users and even those of their friends. Whenever an application is downloaded or a website signed into via Facebook, the companies that own the application or website can see some of the details which is on your Facebook profile. For instance, personal information like your phone number,name, email address, current location, and education/employment history can be seen by the above mentioned companies depending on that particular application. The major point which many people fail to realize is that, so long as you share all these personal information with your friends, the applications that those your friends use can equally get to see the information. Currently, Facebook is encrypting some sensitive information like your name, phone number, and maybe employer in a bid to protect the privacy of its' users. Even at that, nothing stops Facebook from trading those information in bulk to other companies and/or advertisers who would probably end up using such information in targeting or tracking users. For as much as gain is made by Facebook from the data that users share, it won't be very advisable for us to leave everything in the hands of the company to keep our information as safe as we would want it. Having said all these, it is a very nice act to visit Settings once in a while to make sure everything is kept in order. Presented to you below is a guideline on how you can take charge of the way you want Facebook application to make use of your information. >>1. The first step is for you to navigate through to the arrow icon which is located at the top right corner of your page on Facebook. >>2. Choose Settings when the drop down menu appears (Settings can be seen as an option on the drop down menu). >>3. Immediately you find yourself inside Settings, choose Apps (it should be seen on the left hand side of the page). >>4. When you get into Logged in with Facebook, you will be able to view all the applications that are tracking you. >>5. Click on show all show that you can now view the list of those apps tracking you (surprisingly, I saw 47 in mine!). >>6. Hovering over a particular application will make your options visible to you; the option of editing the application's permission or even totally removing it. >>7. If you happen to scroll further down and go through the Settings>Apps region, you will get to see some other options. For instance, your Facebook account can be configured by you to probably log in and get to play games without anyone knowing your identity. >>8. This particular step is of great importance. Choose Apps Others Use in order to put a limit on the data that the application of your friends can be able to get from you. Click on the 3-bar icon found on the topmost right when you open the application. Scrolling down, you will see Account Settings. Open it. 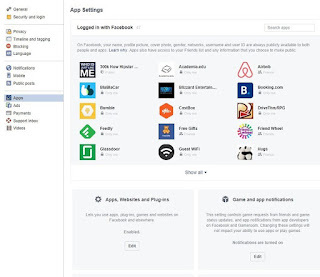 Click on Logged in with Facebook in order to view the list of applications. Click on each application one after the other in order to make changes to the settings; the Remove App is located at the bottom. Click on Apps others use in order to regulate the things about you that the application (which your contacts use) can see. Click on Platform in a bid to regulate notifications of how logging is done into games with Facebook. If it so happens that you have been a long time registered user on Facebook, or if you're very active on it, it really might surprise you when you get to discover the number of applications which have the right to track you. I for one, have had an account on Facebook for more than 10 years, and I got to find out that those seemingly harmless apps, quizzes, and games that I had clicked on in the past still had rights to gain access to my personal information! Moving on, be very careful about any game, application or quiz that is shared to you by friends. Indulging in momentary amusement with apps that tell you things like how you'd look like in the next 20 years, the type of TV character that you are, and the likes of all those rubbish might really not be worth it. But if you feel it's a must-join, then all you need do is go to settings and configure it in such a way as to put a check on your information sharing. If you have used this guide to further secure your information, please share your experience with us, and don't forget to share the article to friends. Thank you.